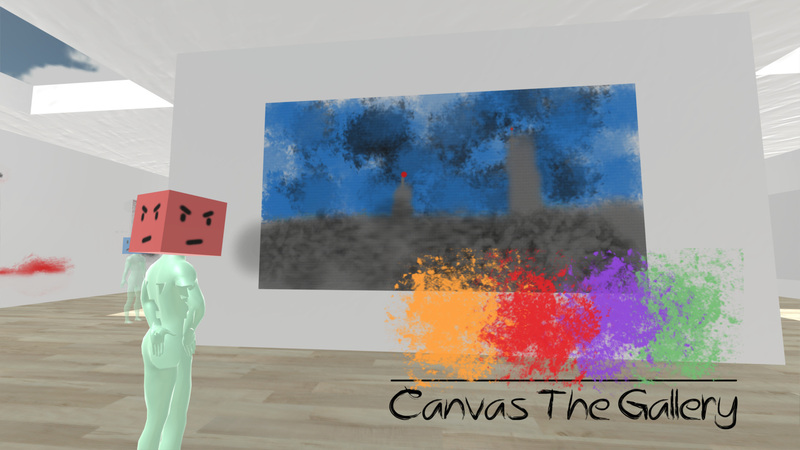 In Canvas The Gallery, you are given an empty gallery, a spray can and let loose. You can paint whatever you want, and people will come and view your drawings. Share your galleries with your friends, or upload your own pictures and have them shown in your gallery. Featuring music by Chopin that will adapt to your painting activity. Each gallery in Canvas The Gallery is a convenient folder, with all paintings available as .pngs. It is very easy to share your galleries with friends. Just send them the folder, or individual paintings, and have them put it in their CanvasTheGallery folder. Then, your friend can edit the gallery, and send it back! Due to the fully accessible painting files, it is possible to swap any picture in and have it displayed as a painting in your gallery. Use your photography photos, photos of your cat, or create a gallery entirely of memes, no one will stop you. There game will be absolutely free. You won't hit a paywall or have to drudge through ads. There will also be a 1.99$ add on which yields a complete color wheel, and more stencils to choose from. You will also get an option to "paste" images, either in the game already, or I will have a folder set up so you can throw in any image you want and the game will let you paste them wherever you want, as much as you want. To promote Canvas The Gallery and grow its popularity (top games), use the embed code provided on your homepage, blog, forums and elsewhere you desire. Or try our widget.